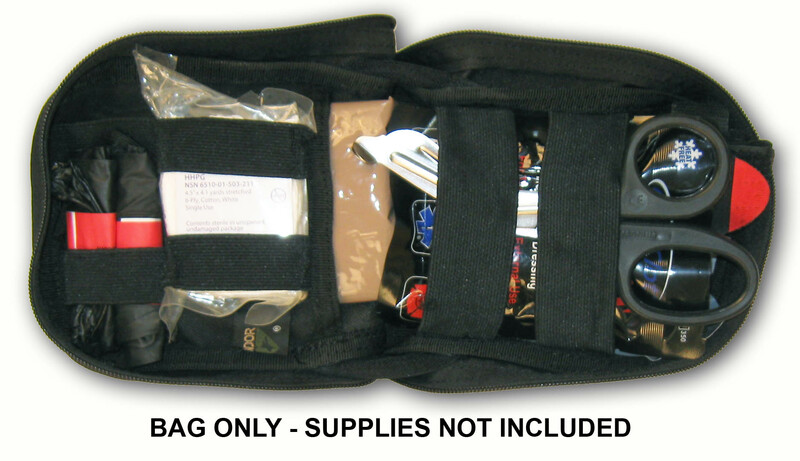 A heavy-duty 600 denier polyester zipper pouch designed for first aid, in MOLLE-compatible format for easy attachment. Features inside pocket, inside elastic, exterior ladder system and more. I was impressed with the quality of these pouches. These are superb and if I had any more molle locations available I would pick up a few more. This is the great little Condor EMT pouch. I had bought this from Amazon, but they sent me one with a broken zipper. Getting it from Rescue Essentials was a better choice. One note about this pouch is that it, in my opinion, doesn't work well as an everyday first aid kit. There aren't any zippered inner pockets and it would be hard to keep smaller items in place. It does, however, work well for a trauma/blood stopping kit. The pouch easily fits for example a pair of shears, the SWAT-T tourniquet, some compressed gauze, and various other items. Great pouch for the price, it fit everything i needed in it with a bit of wiggle room to spare. Good build quality and should last for some time.